The Common Swift does not breed in the Arabian Peninsula (Cramp 1994), despite of this one can see the species in the UAE on migration. Care must be given to separate this species from the very common Pallid Swift. Over the last few years I have collected sightings from reliable observers. Fig 1: The graph shows the count of individuals as well as the number of observations. In April and September Common Swifts were most often recorded, while April and May saw the highest counts in the UAE. 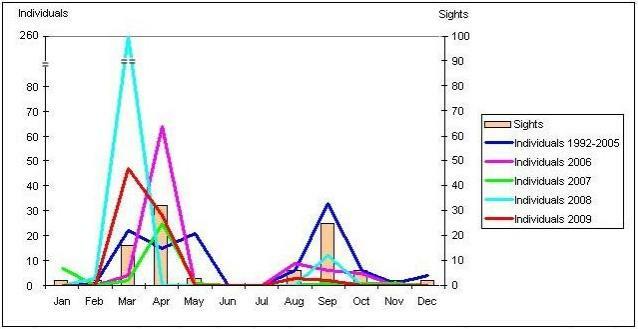 On the graph one can see that the Common Swift is recorded in the UAE the whole year around, except the summer months June and July, when on a very low level. It is obvious that there are two periods of higher activities, one in February - May and one in August - October, while there are no records from June and July, and as expected very few in November - February. Since birdwatching occurs on a near-daily basis year round in the UAE, one can clearly see that the presence of Common Swift follows some structural seasonal pattern, while the rules are not very strict, with a higher presence in spring and autumn, as would be expected from a species on migration in the UAE. The spring and autumn periods correspond with the two seasonal migration movements. The presence in November until Februar (with all together 17 birds from 8 sightings) seems to correspond with isolated reports from Europe (see the collection of "winter sightings" in http://www.commonswift.org/records_english.html) in the same months, than with the likelihood of overwintering here. The low number of records also indicate that the Common Swift in general does not use the UAE as a migration route, and that it is in fact a scarce migrant in the country.